Welcome to the blog tour for AWAKEN by JAIME GUERARD! Many thanks to Shane from Itching for Books and of course author Jamie Guerard for organizing everything! There is another secret kept — Collin, a boy held captive in Bre’s dreams, the boy she is secretly falling in love with but isn’t sure he even exists. As she tries to make it work with Austin, an old friend who could possibly be more, Bre battles against her feelings for Collin. So now we get to the good part (not that cover isn’t awesome, right?) — I get to share my favorite blurb from the book! To avoid spoilers, I took one from the very beginning where Bre first meets the mysterious Collin! “Bre, this is Collin,” a voice introduced me as I approached. Though the voice was somehow familiar, I was oblivious to who had said it. All I cared about was making sure I captured this moment in every detail. Collin’s deep, royal blue eyes looked into mine and I realized I had enver felt like this before. My nerves flared with an intensity that burned deep within me and held me captive in his gaze. Every bit of him was perfect. His silky hair fell perfectly over each side of his face. Occasionally, a stand or two would move gently across his forehead and dance along his eyes. His shirt melted into his chest, making it impossible for me to ignore the definition of his body. He slowly lifeted his hand, gesturing for me to take it. “It’s nice to meet you, Bre.” His bright smile stretched across his mouth as he waited for me to respond. Woo! The first time we meet Collin. Already a bit of mystery and a whole lot of swoon! Okay, that’ll wrap it up for my stop on the AWAKEN blog tour! Hope this blurb caught your eye! There’s also a giveaway!! 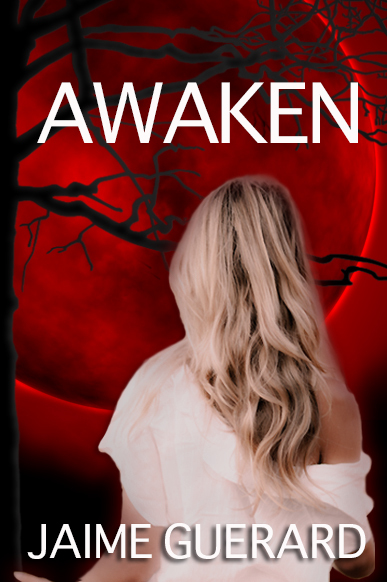 You can win a copy of AWAKEN by Jaime Guerard! Just enter the Rafflecopter form below. Good luck! This entry was posted in Books, Paranormal, Review, YA and tagged Awaken, Blog Tour, Books, Jaime Guerard, Paranormal, YA, Young Adult on May 30, 2013 by Brittany. I’ve been following author Jaime Guerard on WordPress for a while now and I was so excited when she approached me to be part of her cover reveal! Jamie Guerard is super sweet and so much fun to follow. It’s been awesome seeing her posts of all of the exciting steps she’s gone through to get her book published and released to the public! I’m really excited and honored to be a part of her cover reveal. You can also find Jaime at the links below! This entry was posted in Blog Event, Paranormal, YA and tagged Awaken, Cover, Cover Reveal, Jaime Guerard, Paranormal, YA, Young Adult on February 11, 2013 by Brittany.